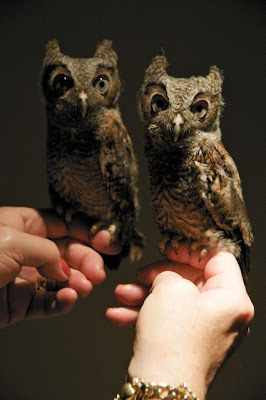 These are baby screech owls that are being raised in a wildlife rescue center. Aren't they the cutest? They look like wise little muppets. I have a *thing* for owls. It started over ten years ago, when I used to hike in the foothills most evenings, and in late summer would see huge owls-- I think they were Great Horned-- perched on the tips of the tallest trees. For me, seeing those birds was like winning the lottery jackpot. I was rich with owls. Then, a few years ago, I met a birding friend as obsessed with owls as I am. At night we would sneak in to the woods to go owling. She would play a tape recording of a Western Screech Owl, and we'd stand perfectly still in the dark, flashlights ready, waiting for a response. 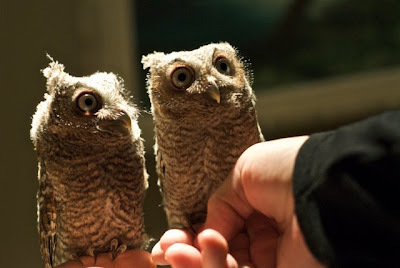 When we heard a hoot, we'd shine our lights in that direction, certain we were about to see an owl. But the only thing we ever saw were wood rats and a bobcat that scared the bejeezus out of me. The next spring, I began seeing barn owls in flight in my neighborhood at night. It was funny the way it started-- one night, I happened to glance up and see one gliding over a rooftop and out of sight. It happened about a dozen more times over the next few months. I'll never forget it, because that was the year I learned that you don't always have to travel very far from home to find what you're searching for-- sometimes all you have to do is step outside and look up at the sky. Here are some owl-themed craft projects you might enjoy. 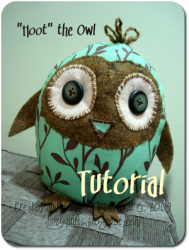 Robyn at Daisy Quilts is offering this cute Hoot the Owl tutorial for free until June 30th, and then it will be available in her Etsy shop. 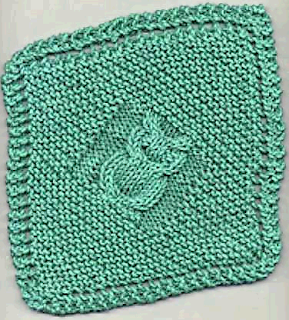 This owl dishcloth, designed by Janelle Schlossman, is available for free at Knitting on the Net. 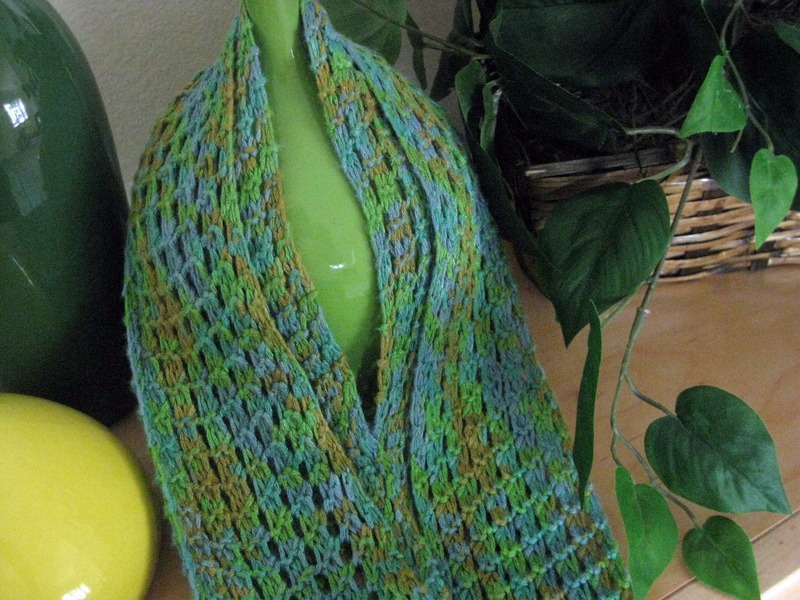 When I started this blog my intent was to share my original knitting patterns. I didn't plan to write much about myself, and I certainly didn't plan to post tutorials for fabric collages! But I did fall head over heels for painting and collaging, so I'm offering this tutorial to others out there dabbling like I am. These simple mini collages are a great way to preserve bits of your favorite fabric and use up scraps. 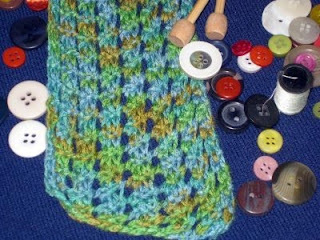 Because they are small and fast to make, you can feel free to experiment with colors, shapes, and styles. I sometimes make two or three at the same time, and won't hesitate to paint over a collage that doesn't turn out as expected. -A tiny canvas. 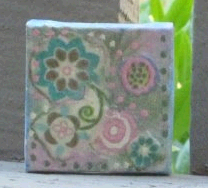 I like the 2" x 2" size found in craft and hobby stores. I have also seen these in Diddams, the party supply store, in the craft section. -Acrylic paints. I buy the cheap-o paints at Michael's for about .75 cents each. -Paint brushes in a variety of sizes. -Acrylic Gel Medium for use as a sealant and adhesive. This is fairly inexpensive and can be found at any craft store. 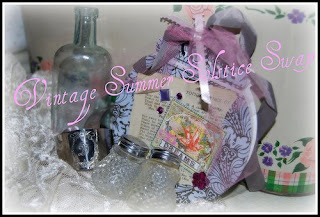 -Modge Podge to seal your finished collage with a bit of a sheen. Again, widely available in craft stores. -Glue for adhering fabric layers to each other. 1. Paint the canvas the background color(s) of your choice. 2. While waiting for the canvas to dry, cut the fabric in to small, interesting shapes. Use a drop of glue to adhere fabric layers to each other. 3. When the canvas is dry, apply a light coat of gel medium to it and then arrange the fabric pieces on the canvas while the gel is still wet. 4. Allow the gel to dry, and then add a frame of paint dots. I learned this technique from the marvelous book Mixed Mania-- using a dried up ball point pen (or the non-bristle end of your paintbrush), create dots around the edge of the canvas in one color, and then go back and use a second color. 5) When the collage is dry, seal it with a light coat of Modge Podge. You can hang these individually or as a series, adhere them to a larger canvas or to a piece of wood. I have a gallery lined up on my patio fence. The website of artist DJ Pettitt also has some wonderful fabric artwork that will inspire you. Andrea at Superhero Journals is giving away a gorgeous handbag. You have until Friday, June 26th to enter. 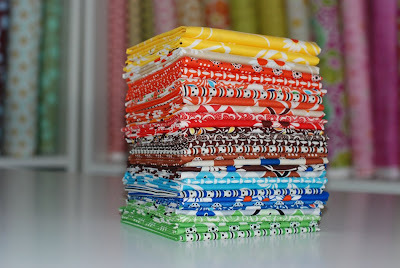 Jen at Miss Punkie Pie is giving away a quilt pattern in celebration of being 100 days smoke free. She will be drawing a winner on Monday, June 29. Congrats, Jen! I've been busy gathering items for the two swaps I'm participating in, A Country Dream's Cosy Crochet and Knitting Swap and The Chateau of Remnants' Vintage Summer Solstice Swap. It's been fun getting to know my swap partners and planning the packages I intend to send to them, but a bit nerve-wracking, too, because I really want them to like what I send and not be disappointed. I was thinking yesterday, while browsing in a thrift store, that one of the wonderful things about swaps is that so many of us love to give to others but aren't as comfortable receiving gifts, and these swaps give us an opportunity for both. I'm hoping that after I've done a couple of them I'll start feeling more comfortable and have a clearer sense of the kinds of things to send. In accepting the award, I have to tell you six things that make me happy. 1) I have a job! I am so grateful to be employed during this recession. I've been laid off a few times in the past, and it's not fun (at least not after the first time when it felt like I was given permission to have an extended vacation). And I actually like my job, which is a refreshing change. 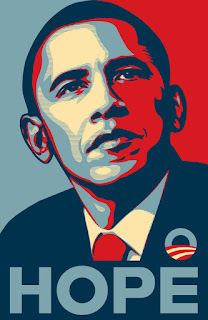 2) Obama is president! That makes me extremely happy. 'Nuff said. 3) The supportive women in my life who inspire and encourage me. You know who you are! 4) My spiritual side. I don't talk about it much because I am a private person, but my spirituality nurtures and sustains me. 5) Crafts! I am so in love with knitting, and I'm in the process of falling hard for painting and collage, too. (I'm a bit of tramp, aren't I?) Crafting has changed my life in so many ways. 6) My kittens, of course. Charlie and Apollo are the most loving, snuggly cats I know. I can't imagine my life without them. My friend Rachel at Not-So-Plain Jane is having a giveaway. Just leave her a comment by June 30th, and you could win this adorable purse. Good luck! That's where I go when I feel like I've lost touch with myself and need to remember what's true and what's important. I took head-clearing drives through forested mountains, visited an art museum and galleries, shopped for yarn, had picnics on the headlands and took a walk through an old-growth redwood forest. The best part was sitting on the edge of a cliff, watching the ocean crash below, being lulled by the sound of the waves, and feeling like I'd come home to myself. I've been yearning to get away and spend some time in nature, so I'm heading north for a few days. See you soon. 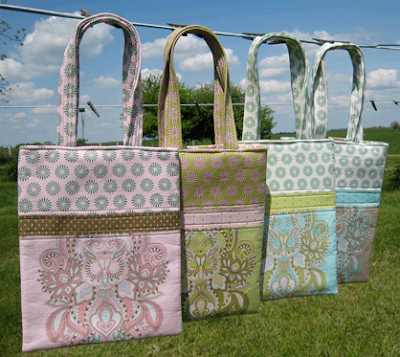 Tula Pink is giving away these four beautiful bags! I almost hate to tell you about it because I really want to win one. Oh well. You have until June 15th to leave a comment on her blog. If you must. 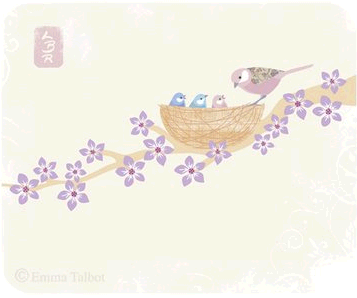 Emma at Little Brown Rabbit is giving away this Chiffchaff print. I didn't know what a Chiffchaff was and had to look it up-- I thought it might be some sort of exotic art technique. Turns out it's a type of bird. Anyway, I think the print is adorable. You have until June 15th to throw your name in the hat. I learned about a cool blog from Melanie at A Country Dream. It's called Swap Dex, and it's an index of the swaps going on right now on the blogs. I signed up for a couple and I'm pretty excited about it-- I've wanted to join one for a while, but always seem to find out about them too late. We got a little rain today, which rarely happens in June. Everything looks a bit more green and lush. Around here you have to enjoy the green while you can because in the summer the surrounding hills turn crispy brown. And then they start to burn. Today's romping lawn-bird is a phoebe. I accidentally got a picture of it hovering over the lawn. Pretty cool. Poor Charlie, he wants to chase a bird so badly, but he's trapped in apartment jail. Before I got a cat I used to get furious at people who let their cats roam free and kill birds. Then when Charlie came in to my life, I felt so bad for him stuck inside all day that I caught myself thinking, well, maybe it would be okay if he went out and just got one bird. Yikes!! I'm a bird lover! I started walking him on a leash at night instead, which is a good compromise, I think. At least it is for me. And here is a picture of Apollo that I took this morning, in case he reads this and feels left out. I'd love to write about him more, but he doesn't like to hold still for pictures. Apollo is a shy, nervous guy who spends most of his time sleeping in the closet. I do what I can to make him feel safe and loved, but he's very much a skittish loner. My latest 2x2 inch painting/collage ... I've completed five of them, and they are all lined up on the fence on my patio like little tiles. Hope you have a good weekend. I've been under the weather all week, so I'm going to be taking it easy this weekend. At least I'm going to try. I have such a hard time slowing down these days-- I'm constantly running errands and cleaning and doing other stuff that seems so very important, but isn't. Andrea at Superhero Journal has a great post about this very subject if you'd like to check it out.